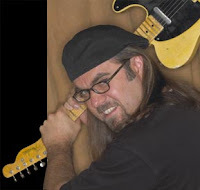 Greg Koch has a great line of guitar lesson books. Greg Koch plays a lot of Summerfest gigs. Greg Koch has a great attitude. If you want to score yourself some Greg Koch rock at Shank Hall, you better show up with tickets in hand on September 7th. That's when Greg will be crankin' out the tunes.